A while ago we ate at a Vietnamese restaurant in San Francisco's Chinatown. We were given these nice burnt sugar-flavored beverages to drink, but unfortunately the staff did not speak fluent English so I don't know what it was called. I've tried in vain to research it but can't find anything close. The beverage was very dark brown, but served with milk (I'm quite sure it was dairy milk, not coconut milk) poured on top, which when mixed turned it a caramel color. The consistency was thin, but the beverage was very flavorful---the burnt sugar flavor would have been almost bitter if it didn't have the milk added. Burnt sugar seemed to be the only major flavor---it was not a coffee beverage, though there might have been other spices. The beverage was sweet, but not extremely sweet. It was served in a standard plastic restaurant glass with ice. I found the restaurant's menu online. Apparently this is Tra Thai. I must have mistaken the flavor. Since we have a canonical answer already, perhaps there might be room for a speculative answer without stepping on toes - that is, if someone is interested as I am in figuring out how the originally described drink might have been...because it sounded interesting. I first thought it might be a Vietnamese equivalent of agua dulce, which is a hot raw-sugar drink (con leche when served with milk), served as an alternative to coffee or tea - the molasses in the raw sugar gives it more flavor than just sugar. Obviously, this is the wrong country and language, being from Costa Rica, but Vietnam has its own sugarcane - and drinks fresh sugar cane juice cold - so there is no reason it might not have a hot drink equivalent. And being burnt-sugar flavored, which would probably be due to processing, might be a local variation due to cultural flavor preference (bitter like coffee or strong tea) or economics (not wasting over-processed sugar, which then becomes the traditional flavor). Historically, this sort of drink was used for extra energy for laborers, so the sugar content - and minerals and vitamins that came with the raw, minimally processed sugar (which was also laborer-cheap, and had enough flavor to stand as its own drink) - would be a welcome boost. 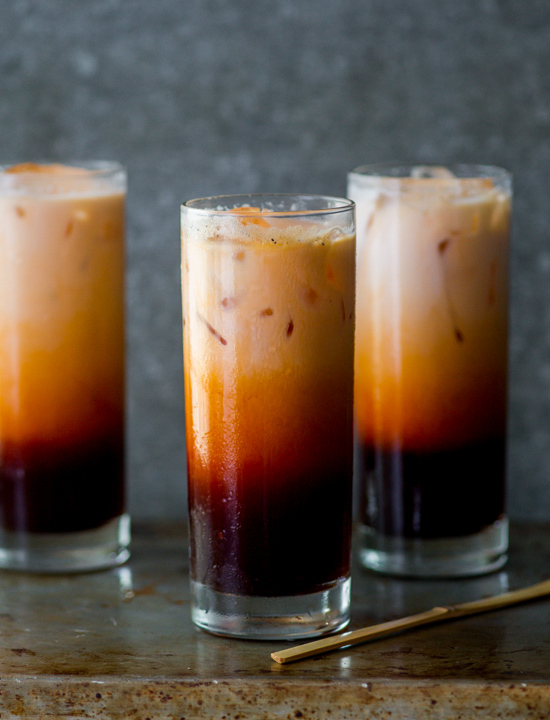 Since this sort of drink would be served like coffee or tea, both of which are brewed strong and bitter and served sweet in Vietnamese cuisine, the dark and bitter notes from a burnt sugar equivalent of agua dulce would probably be welcome. If this were a historical drink, the burnt notes would probably come from the processing, if the sugar being evaporated down was cooked a little too long or at too high a heat - either poor quality control, since it would be the cheapest raw stuff for a laborer drink, or eventually on purpose to get that flavor profile. Scorching on purpose on an individual level would take time, effort, and skill - less likely for a common, laborer level drink and more likely if it were a rarer delicacy higher up on the status chain. Though in that case, I don't imagine raw sugar would be traditionally used, and the resulting drink would lose out on the heartier flavor profile - perhaps instead being used (as burnt sugar syrup is today) as an exotic flavoring added to a different drink rather than standing on its own. So to make something like this drink, probably one would start with raw sugar - and I mean raw like jaggery or dulce tapa or piloncillo, minimally processed with all the impurities still included, which is about a third less sweet than processed stuff and has enough of its own flavor to be the base of a drink. Jaggery would probably be the most authentic, as it is used through Asia, but they're similar enough to pick any by preference or availability. To get the burnt-sugar notes, it would have to be further cooked - burnt sugar syrup is usually made with a dry caramel method, where the sugar is heated until dark, just starting to smoke and with the beginnings of bitter notes in the scent, then cooled with water to stop the burning (which involves lots of spluttering and seizing) and mixed until the sugar dissolves into a syrup. Any other spices could be infused on their own, or added to the syrup. Most recipes for burnt sugar syrup use processed white sugar, some few use regular brown sugar (white sugar with molasses added back in). Raw sugar doesn't have to behave like either, so I'm not sure it will melt quite as easily or still be clumped up even when hot enough to scorch... it can be pretty hard stuff, and also its preparation might matter - that is, if it were grated vs chopped as well as if it were a softer or drier variety - but even so, it should be able to be roasted till those dark burnt notes appear, and dissolved into water afterwards even if it takes a little longer. Alternately you might use much less water and make a burnt-sugar candy, which will likely store better (shelf stable) and which can be dissolved into water at need to make the syrup - much like our pseudo-historical drink. The syrup, once made, could be heated and thinned if desired with water or a spiced infusion, and would then be either mixed with milk or served with it on top, to taste - either evaporated milk, or condensed, as both are used in Thai coffee or tea recipes. It should be quite a dark brown and very sweet, with dark bitter notes from the scorching, and also earthy from the molasses in raw sugar. Which sounds...very tasty, I would like to actually try this at some point. Not the answer you're looking for? Browse other questions tagged sugar food-identification dairy beverages vietnamese-cuisine or ask your own question. Why would milk form a dense emulsion when warmed?